Bruce Cope has been designing and building aluminum boats since 1973. He founded Cope Aluminum Boats in 1987 and since then his company has built over 450 boats. In 2001 the company shifted its focus exclusively to boat design. Early experience in aluminum boat building include working with Sam Matsumoto’s company in North Vancouver BC, one of the pioneers of aluminum boat building in North America, and 2 years on Canada’s Americas Cup team that challenged for the cup in 1987. America’s Cup boats were all aluminum back then. Bruce enjoys passing his knowledge of aluminum boatbuilding on to the next generation of boat builders. He was the consultant for the Vancouver Island University aluminum boat building course and was an instructor as well. Our team consists of three designers and one support staff. We design custom boats, we have a portfolio of stock designs, and we offer consulting services for aspiring production boat builders. 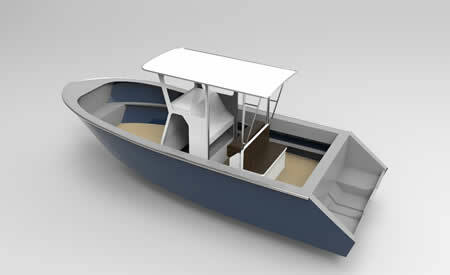 To design our boats we use state of the art dedicated boat design software, Autoship, Autostructure and Autocad. Autoship: The best marine 3D surface modeling program available. It is specifically for boat design and includes the ability to do hydrostatic calculations and plate development (turning curved hull plates into flat patterns for the cut file).The complete hull, deck, and cabin is drawn in Autoship. It is an expensive program, but the quality of its output is unmatched. 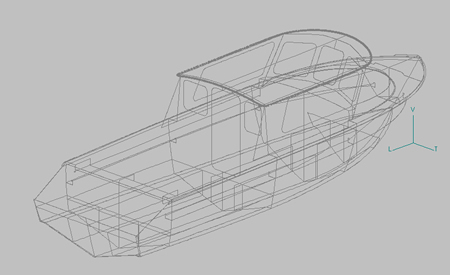 Autostructure: A 3D marine modeling program, Autostructure is a sister program of Autoship, and is used to design the internal structural components of the boats, such as frames, bulkheads, longitudinals, and girders. 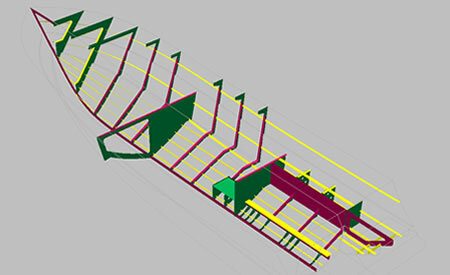 This program has the ability to produce parts that the programs used by most other designers simply can’t, such as longitudinals that are normal to the surface of hull plates. 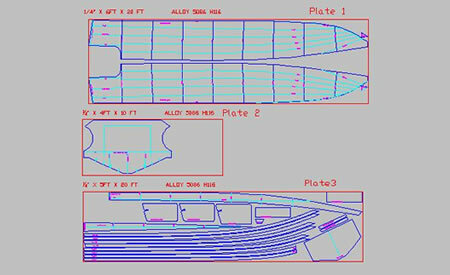 Autocad: The drafting program we use to produce the cut files and construction drawings for each boat. Fourty five years of aluminum boatbuilding and designing experience allows us to offer you designs that are practical, good looking and durable. Keyshot: The state of the art program allows us to produce photo-realistic renderings that let our clients visualize what their boat design will look like before it is built.